So. A year of waiting, several weeks of research and writing, and it's finally here: the November 2011 issue of Armchair General. 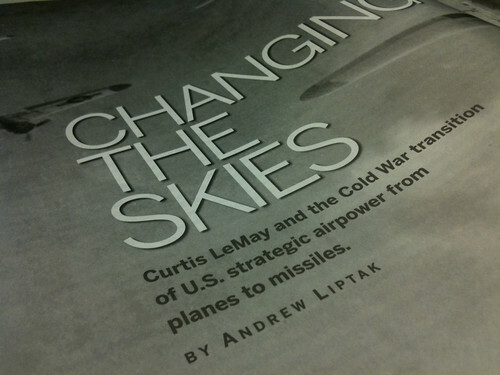 On page 36, and running for 8 pages (including some awesome pictures and captions), is my first print article titled Changing the Skies: Curtis LeMay and the Cold War Transition of U.S. Strategic Airpower from Planes to Missiles. It's a bit of a long-realized dream, and on Saturday morning a couple of weeks ago, I opened the mail to find a thick package with several copies: my advance copies of the entire magazine, in glossy print, with my name right below the article title. In March of 2010, Norwich University held the annual Colby Symposium, a two day event dedicated to military history and writing, typically on the ongoing wars in Iraq and Afghanistan, at least since I've been there. I've missed a single year since 2002, and ever year, I come away from the talks with a better understanding of how War works. Almost two years ago, while at the Meet the Authors Dinner, I met Col. (RET) Jerry Morelock, the editor in chief of Armchair General, which sponsors a student scholarship, and we began to talk. He gave me his card, and within a couple of days, I'd e-mailed him back with a couple of article ideas. The one that stuck was a transition from the Second World War to the Cold War, particularly when it came to how the United States transitioned from aircraft to missiles. The article came out of a couple of projects that I'd been working on prior to that. In 2009, I'd finished my Master's in Military History through Norwich, and I'd presented at two conferences, one of which, I presented my capstone paper on Spaceflight and the Military influences, particularly the strategic arms race that raged between the US and USSR. After finishing that work, I came across some additional sources that shed more light on the broader subject, and I wanted to explore more about it. After gaining approval for the article and signing the contracts, I began research, looking to tie together a better story than the scattered ideas that I had, eventually discovering that much of the history went through General Curtis LeMay, who had implimented many of the lessons that the US put to the skies post-WWII. The article was turned in, then it came back for a couple of rounds of revisions, and by May, it was complete, a nice feeling. I moved on to a couple of other projects, and soon, the magazines appeared at home. (Another issue, July 2011's, also features a classmate, David Armstrong, with another piece that I've got on the to-read pile.) It's something to know that they'll be coming out, with all the work completed, but it's quite another to see the finished product, from the cutaways, the pictures (and the absolutely gorgeous front page spread), and my name under it all. The people at the magazine seemed to really like it, and the various family members and co-workers who've taken my advance copies have also been quite positive with their reactions, something I barely dared to hope for. It's been a very, very cool opportunity, one that I'm following up with another project through Armchair General, this time on the late General Ernest Harmon, who commanded the 2nd Armored Division during the Second World War. The research is exciting, and I'm looking forward to getting this one written and turned in. Changing the Skies appears in the November 2011 issue of the magazine, but subscribers should be receiving it now (I've gotten an additional copy through work in the mail). You can subscribe to the magazine here and get more information about the magazine at their website.